The Rockwell RK7315 is a compact, lightweight scroll saw that’s inexpensive despite being built with some strong capabilities and nifty features. 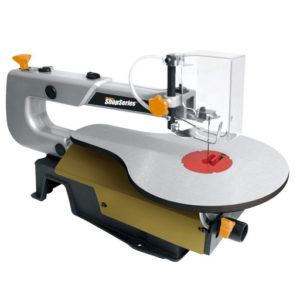 It’s a variable speed scroll saw that has a 4/5″ stroke that almost guarantees accurate cuts. The table that bevels up to 45 degrees enables more specialized cuts. There’s also a dust blower and dust port that ensures the work area stays safe and clean at all times. In this Rockwell RK7315 scroll saw review, we’ll look into the advantages and drawbacks of this scroll saw and conclude with who this saw is catering to. For the price, the saw is built well. Staying true to its mission, the saw is easy to use and master. Also, the blades are fairly easy to change – a point where most beginners get stuck. This is one of the cheapest reliable scroll saws available out there. If you’re just starting out with woodworking or you’d like to learn the trade, the RK7315 would be your ideal tool. As aforementioned, this is a fairly inexpensive scroll saw targeted at beginners. Therefore, do not expect this saw to cater to your professional requirements.The table doesn’t tilt in all directions, which makes specific bevels slightly more difficult. The vibration is quite noticeable on this saw. But you can easily dampen that by using some vibration damper pieces. The instruction manual that comes with the saw isn’t the most comprehensive or easy-to-understand booklet around. For instance, there isn’t much information about how to turn the blade for specific cutting depths. Fortunately, there are plenty of online sources that can help you learn the intricacies of working with the saw. • What blade size does the RK7315 use? The blades used are 5-inch t-tip blades. There are several options as far as blades go, which you may pick depending on your specific project requirements. • What is the saw’s voltage capacity? The saw works at the 110-115-volt range. • Does this saw cut sheet metal? Like almost every other scroll saw on the market, the RK7315 also manages to cut through sheet metal. However, the speed at which you can connect the metal may not be on par with more powerful, expensive scroll saws. The saw is manufactured in China, where most American scroll saw makers have their manufacturing bases. • Does the saw use unpinned blades? You may use unpinned blades with this saw, provided you have an adapter for it. The Rockwell RK7315 isn’t your power woodworking tool. People who are accustomed to more potent machines would find this saw quite underwhelming. That said, amateurs or beginners would be more than satisfied with this Rockwell scroll saw. It works well and can perform a variety of woodworking tasks. Moreover, since the saw is just a shade over 100 dollars, first-timers won’t get a better value at this price. And it’s not just beginners, small shop owners would also find this saw quite handy.